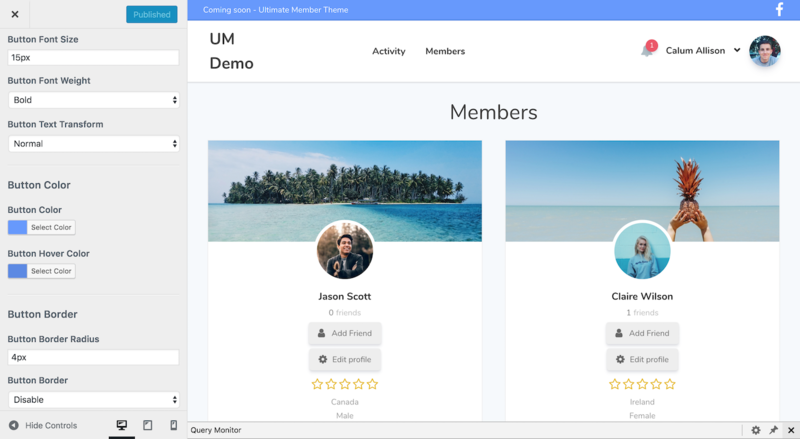 Why use Ultimate Member theme? The theme is integrated with the WordPress customizer allowing you to easily design your site just how you like it. Change any aspect of it including colors, fonts etc without needing any coding knowledge. The theme allows you to easily style the extensions via the theme customizer. In addition, the theme is integrated with the following Ultimate Member extensions. When using the theme with the real-time notification extension an icon will appear in the header. This allows users to easily receive updates wherever they are on your site. When a user receives a notification an alert will appear over the notification. The private messaging extension, when combined with the theme, will add a message icon to your website's header. When clicked this will open up a modal allowing users to easily see who has messaged them. The theme comes with a different header layout for users who are logged in. When a user is logged in, the header will show the user's avatar and display name. Additionally, if you are using the real-time notification and private messaging extensions an icon will appear for each extension in the header. The theme comes with a different header layout for users who are logged out. When a user is not a logged-in you can show a register or login button in the header (or both). Having a register call-to-action button in the header will help to encourage users to register on your site. The theme comes with optional top & bottom header bars. 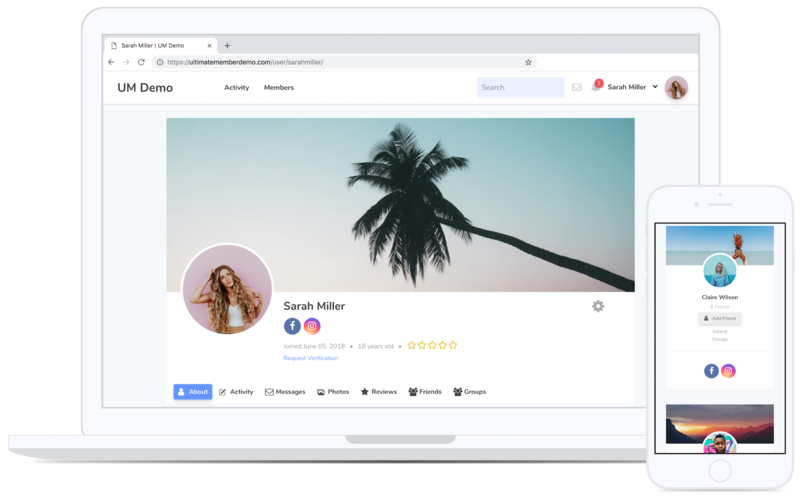 The top bar comes with a 1 or 2 column layout and allows you to show a menu, display custom text and/or show social media icons in the top bar. Websites with logged in users general have additional items in a header compared to a static website. This is where the bottom bar comes into play. It is the perfect place for showing additional menu items. With the bottom bar, you can have it show by default or "visible on click". When "visible on click" is selected an icon will appear at the end of the main navigation menu in the header. Theme integrates with Ultimate Member perfectly and I love being able to have a different header design for logged in and logged out users. I'm able to customize the theme easily and it works great with Beaver Builder! Highly recommend! Can I use the theme without Ultimate Member plugin? Yes, you can. Whilst the theme has been built with a deep integration with Ultimate Member, the theme does not require the plugin to work. Does your theme work with mobile devices? Yes, the theme has been built to display beautifully on mobile devices. All of our themes are specifically designed to be mobile responsive. What page builder do you recommend using with the theme? We recommend using Beaver Builder or Elementor page builder plugins with our theme. Yes, we have a 30 day no questions asked refund policy. So if you purchase the theme and decide it is not for you we will provide a full refund if requested within 30 days of purchase.